Meta Knight trapping Kirby and then slashing him. Galaxia Darkness (ギャラクシアダークネス, Galaxia Darkness) is Meta Knight's Final Smash in Super Smash Bros. Brawl and Super Smash Bros. 4. It was first seen on videos from E for All before appearing on the DOJO!!!. When used, Meta Knight swings his cape out directly in front of him while shouting either "Know my power!" (思い知れ!, You shall realize!) or "Behold...." (見るがいい! !, Behold!!). If he misses with his cape, Meta Knight pauses for a brief time, and the Final Smash fails. When it connects (the trapping hitbox is a bit longer than the edge of the cape), characters trapped by Meta Knight's cape become invincible, but trapped at the spot where they were caught by the hitbox. The screen then darkens to black, and after a few seconds, a large, single slash appears near Meta Knight, as he then slices the trapped opponents with one, powerful strike. When Meta Knight slashes, he either swings upward or performs a standard slash, though this does not affect the attack's strength. Characters who are trapped by Meta Knight's cape always receive 40% damage, and high, upwards knockback that can KO above 50%, with super armor ignored. Any opponents who are not trapped are also attacked, but instead take about half damage and weak, upwards knockback, with the opponents being hit in player order. Unusually, these slashes can hurt allies as well, even with Friendly Fire disabled; even more unusually, these slashes disregard super armor, making moves with launch resistance ineffective for defense. The weaker slash part of Galaxia Darkness can be avoided by dodging with correct timing. This is a bit harder when playing online with anyone due to players having different player numbers. 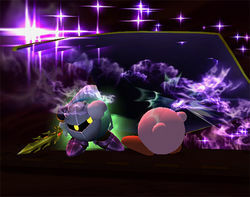 The move returns in SSB4 with a starry sky graphical effect applied to the inside of Meta Knight's cape. It also no longer affects teammates with Team Attack off. Galaxia is the name of Meta Knight's sword in the anime, Kirby: Right Back at Ya!. A legendary sword with immense power, it appears to be a mere hilt when sheathed, with the blade forming after being drawn. The multi-pronged design first appeared in the games with Kirby Air Ride, where Meta Knight used it in his first playable appearance. At the time of Brawl's release, however, it had never been referred to as "Galaxia" in the games. Kirby's Epic Yarn, released after Brawl, is the first game to name the sword "Galaxia". The move itself is named after the sword, while the darkness is created through his Dimensional Cape. The actual attack appears in Kirby: Planet Robobot, as part of Meta Knight's moveset. It visually resembles his Final Smash, only with a horizontal strike as opposed to a diagonal one. Galaxia Darkness trophy in Brawl. Galaxia Darkness trophy in 'Super Smash Bros. for Wii U'. Meta Knight swings his cape to ensnare foes. Darkness falls, enveloping them in an empty void, and then a giant sword slash cleaves the blackness. If the cape doesn't capture anyone, this Final Smash will fail. It has more range than you might think, though, and you only have to catch one foe to deal damage to everyone! The spring lag glitch is a glitch in Super Smash Bros. Brawl which causes a character hit by Meta Knight's Final Smash to get characters frozen on a spring for a short time. As such, this glitch can only be performed on stages that have springs, like PictoChat and custom stages. To execute this glitch, Meta Knight must break a Smash Ball and use Galaxia Darkness to hit the opponent into a spring. The character that was hit should be stuck in the spring until the duration of Meta Knight's Final Smash is over. The inside of Meta Knight's cape in Super Smash Bros. for Wii U.
Galaxia Darkness in Super Smash Bros. for Nintendo 3DS. The cape has a small hitbox just behind Meta Knight, about the length of his sword. As a result, he can hit opponents behind him when the Final Smash is starting up. If Meta Knight captures one of the Ice Climbers in Galaxia Darkness, but misses the leader Ice Climber, and the leader Ice Climber gets KO'ed, or SD's, the other Ice Climber, despite having invincibility frames from returning to the stage, will get hit regardless. Furthermore, if Meta Knight catches one of the ice climbers and not the other, then both Ice Climbers will be hit by the initial pre-slash attack, with the trapped Ice Climber also receiving the main slash as well, dealing a total of 58% damage and guaranteeing knockback stacking. Galaxia Darkness is one of the five Final Smashes that can affect a team player (Brawl only). End of Day, Landmaster, Iceberg, and Puff Up share this trait. If Meta Knight uses Galaxia Darkness on a character firing a Super Scope, the character that was firing it will stand in a more progressed bind position, or holding their arms out in a "T", just like with moveset swapping, although it is different for some characters (example: Yoshi, R.O.B., Mr. Game & Watch). If Meta Knight uses Galaxia Darkness on Kirby using Stone, then he will be sent into the bind pose for the duration of the Final Smash. 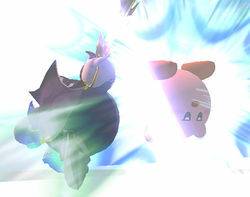 This is similar to what will happen if Blue Falcon or Triforce Slash was used on Kirby's Stone move. If Meta Knight uses Galaxia Darkness on King Dedede using Jet Hammer, King Dedede will be in the same pose, but his hammer will lack the jet effect. The Trophy description mentions Meta Knight's ability to hit others outside his range, and that "one can imagine Meta Knight zipping back and forth quickly to accomplish this." However, Meta Knight's silhouette can be seen when doing so. This page was last edited on January 15, 2019, at 22:03.